By Angela Doland . Published on March 19, 2019. 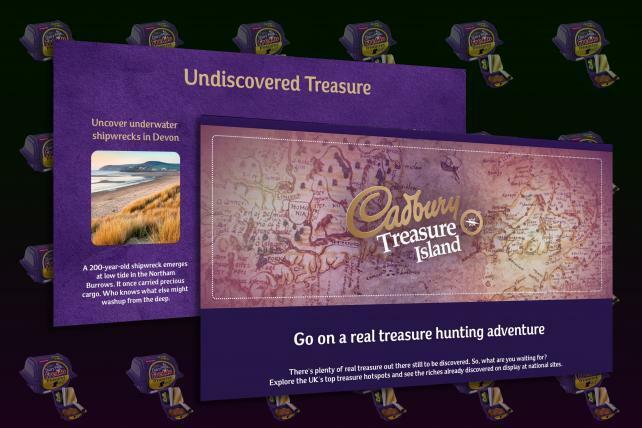 Cadbury, the chocolate brand owned by Mondelez International, ran a lighthearted, treasure hunt-themed marketing campaign in the U.K. that backfired in a big way; the campaign was decried as "irresponsible" and "intensely stupid." The brand had encouraged people to search for undiscovered treasures at Viking-, Roman-era or other historical sites. One ad urged people to "grab your metal detector and go hunting for Roman riches!" As incredulous archaeologists pointed out, that's looting. Helen Farr, a maritime archeologist at the University of Southampton, tweeted at Cadbury: "You're advocating looting & theft of cultural heritage...erm." The U.K.'s minister for arts, heritage and tourism branded it as "irresponsible." Aisling Tierney, a Bristol University archaeologist, called it "intensely stupid and deeply illegal," the BBC reports. There's been endless discussion about digital ads and "viewability" -- whether ads can actually be seen, or if they're hiding somewhere on the screen. TV commercials typically don't figure into the viewability conversation, but now a report from IPG Media Lab says they should. Working with data from TVision, the IPG lab says that for 29 percent of TV ad deliveries, "nobody is in the room for at least two seconds while the commercial is airing," Ad Age's Olivia Raimonde writes. That number is similar to the 31 percent of digital video considered unviewable, IPG says. Actually, this poses a philosophical question: If a commercial plays in a living room and no one is around to hear it, does it make a sound? Some creators ditched Snapchat, saying they couldn't make money there. But things seem to be looking up, and some Snapchat creators tell Ad Age's Garett Sloane that they're getting brand deals. For example, Cyrene Quiamco, better known as CyreneQ, has been earning $30,000 per Snapchat Story mentioning McDonald's. Sloane writes that Snapchat is strong on augmented reality, and "if Snap is going to remain ahead of the pack, it needs to keep AR creators like Quiamco happy and prevent them from defecting." Another one: "Kevin Tsujihara has resigned his post as chairman-CEO of Warner Bros. following an investigation into his relationship with actress Charlotte Kirk and allegations he used his clout to help her find work at the studio," Variety reports. Own goal: "ESPN apologized after it leaked the women's NCAA tournament bracket on Monday afternoon ahead of the official reveal," Sports Illustrated writes. 'Faster, better, cheaper': The first financial results from Martin Sorrell's new digital marketing venture S4 show it's getting some traction, and Sorrell says the "faster, better, cheaper" positioning resonates with clients. Read more by Ad Age's Megan Graham. In the cloud: Are you moving to the marketing cloud? Ad Age's George Slefo talks to the experts about how to do it. MediaLink's Mark Wagman says companies "need to start slow and make sure they don't bite off more than they can chew initially; integrate a single tool or tool set and build from there." Tweet of the day: "AjdwhlAKjdhlakjd;lkajwd;lkAj;lkda," the Detroit Free Press tweeted Sunday. Was it the mother of all pocket tweets? A beer-soaked Saint Patrick's Day mega-typo? Who knows. But the paper followed it up with, "Can't wait to submit this one for a Pulitzer." Number of the day: $200,000. Michael Sanchez, whose sister is the girlfriend of Amazon CEO Jeff Bezos, allegedly sold the billionaire's racy text messages to the National Enquirer's publisher for $200,000, The Wall Street Journal reports, citing people familiar with the matter. Ad of the day: For months, Apple CEO Tim Cook has been trashing rival tech companies over their data privacy failings. And it turns out his stance was the prelude to a marketing campaign about Apple's own privacy prowess. (We probably should have seen that coming.) In a new commercial, Apple's message is that "privacy matters," Ad Age's Ann-Christine Diaz writes. The spot is from TBWA/MAL and was directed with a light touch by Alexander Payne, who made "Sideways" and "The Descendants." Basically, the ad depicts all the situations in life where privacy is key, including at the urinal. Check it out here.